What will happen next in Syria's War? What remains from the so-called Arab Spring? 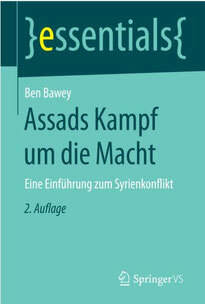 Ben Bawey is a Political Scientist and Islamic Scholar born in a small village in Thuringia, the green heart of Germany. Along his school years, he developed a growing interest for the Middle East. Subsequently; Bawey chose to pursue Political Science, Communication, Media and Islamic Studies in the Friedrich-Schiller-University of Jena. After a Masters degree, Bawey have worked and lived in Tunisia where he wrote his first two books. He discovered a shattered country, rattled by a revolution: “Tunisia -the cradle of the so-called Arab Spring- has made a precarious way towards a future that is far from certain. Ben Bawey is currently living in the United Arab Emirates. His new book “Assad’s Struggle for Power. An introduction into Syria’s War” is out now through Springer Fachmedien, Germany’s leading scientific research publisher. Five years of war in Syria! Complimentary extracts from the book and additional OnlinePlus material you may find here.